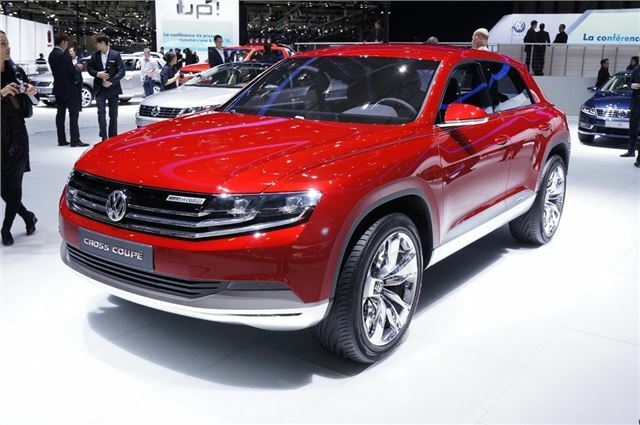 Volkswagen has shown its Cross Coupe concept at the Geneva Motor Show. The sporty SUV - in a similar vein to the Range Rover Evoque - was first unveiled at the Tokyo Motor Show last year, but this concept version has been further improved. It was originally fitted with a plug-in hybrid system that combined a petrol engine with an electric motor. But this new version has a TDI diesel with two electric motors which means it can return an average of 157mpg with CO2 emissions of just 46g/km. It's not just about economy though with a maximum of 306PS from the hybrid powerplant and a kerbweight of 1858kg plus a top speed of 137mph.